Go paperless with unlimited storage space. We can digitise any of your documents and attached them to any jobs you may require. Send an employer to site and have him fill out the paperwork on his tablet and instantly receive the document. It can certificates, job sheets or any document you require. Having the file manager deature means you will never lose your paperwork and you can also set yourself reminders to action documents in future if needed. In our admin system, you can amend any documents that have been filled out and you can either print or email these to customers or your workforce. 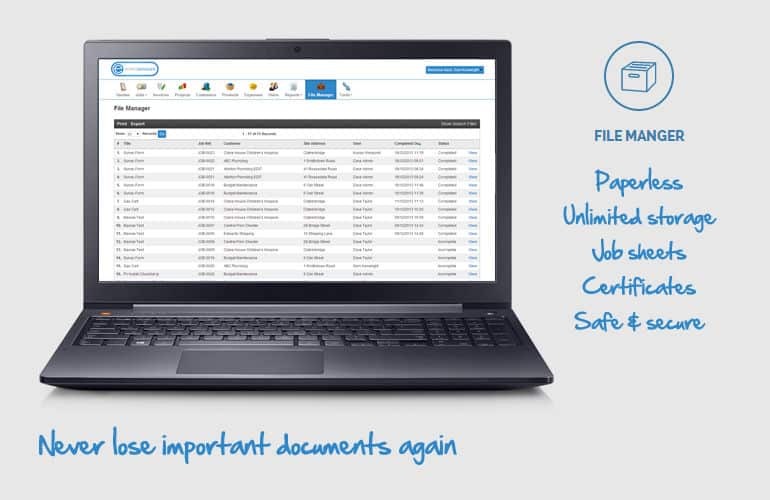 Get signatures off clients or employees digitally and store important documents in one central system. You have the ability to see what has happened in the past.